MCP16331 click functions as a non-inverting buck-boost voltage regulator, a type of switching mode power supply topology that combines the principles of the Buck converter (step-down) and the Boost converter (step-up) in a single circuit. The Buck converter produces a DC output in a range from 0V to just less than the input voltage. The Boost converter produces an output voltage ranging from the same voltage as the input to a level much higher than the input. 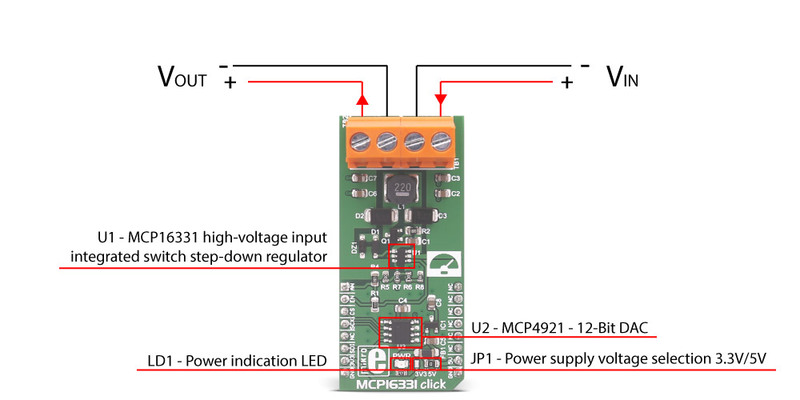 The MCP16331 click itself produces constant DC voltage on the output rails, which can be set in the code. A typical application for a buck-boost regulator is a battery-powered system, where the input voltage can vary widely, starting at full charge and gradually decreasing as the battery charge is used up. At full charge, where the battery voltage may be higher than needed by the circuit, a buck regulator would be ideal to keep the supply voltage steady. However as the charge diminishes the input voltage falls below the level required by the circuit, and either the battery must be discarded or re-charged; at this point, the ideal alternative would be the boost regulator. By combining these two designs, it is possible to have a regulator circuit that can cope with a wide range of input voltages both higher or lower than that needed by the circuit. The click board(TM) central module is the Microchip's MCP16331, a non-synchronous, step-down or buck converter capable of stepping input voltages ranging from 4.4V to 50V, and output voltage ranging from to 2.0V to 24V. More details about the MCP16331 are available in the official datasheet. The MCP16331 click is designed to handle an input voltage ranging from 4.5V to 18V and output a voltage ranging from 2,25V to 12V at 500 mA maximum current. The power source is connected to the TB1 (VIN) terminal, and the load is connected to the TB2 (VOUT) terminal, at the top of the click board™ (as you can see in figure 1). The power circuit is isolated from the logic circuit that, as per the mikroBUS™ standard, can operate at 3.3V or 5V. The voltage is selectable via JP1 switch, by default set at 3.3V, and the green LED (LD1) indicated that this voltage is present. The MCP16331 click uses the SPI bus present on the mikroBUS™, to communicate with the host processor, however, also uses two extra pins AN and RST that are used respectively for measuring the output voltage and enabling or disabling the MCP16331 output, this is important for the correct power sequence (see note below). The reason for this sequence is that the enable pin (EN) of the MCP16331 has an internal pull-up resistor that keeps the MCP16331 output stage enabled even if the pin is left unconnected. At power-up, before you set the voltage via SPI, DAC output is unspecified and the output voltage may set higher than what your load supports. Setting up the desired output voltage is easy if you use the libraries we developed for this click board™. We made available a specific function that sets the VOUT voltage (see below in the Software Support section). This feedback mechanism is useful when you want to set an exact voltage. You can measure the output and adjust the voltage.